We are offering automatic charger. Elak automatic chargers are designed to provide fast, safe and efficient charging to a wide variety of battery types and sizes. The electronic control circuit monitors the charging process to avoid battery damage caused by overcharging. The charger collects information from the battery and adjusts the charge current and voltage based on this information. This allows the battery to be charged quickly, correctly, and completely when using an automatic battery charger. automatic battery chargers can remain connected to the battery indefinitely and will not overcharge or damage it. technical info automatic battery chargers are fitted with an electronic control circuit which monitors the battery voltage and accordingly supplies the required charging current through thyristors (scrs) to the battery. the chargers have a wu charging characteristics, i.e. Constant current, current voltage. the chargers are protected against over-load, short-circuit and reverse polarity. 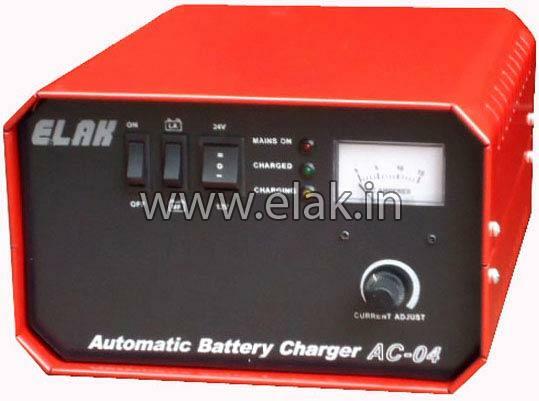 charging current is indicated by a high quality ammeter. Some models have controls for adjusting the charging current and also the no. Of batteries (12v or 24v). leds are provided to indicate the mode of operation of the charger, whether it is in the charging (boost) mode, or charged (float) mode. some models also have an end voltage selector switch for charging regular lead acid and maintenance free vrla batteries. features :- constant current charging charges 12v and 24v batteries controlled at all times by a microprocessor reverse polarity & short circuit protected analog ammeter power supply voltage : 230v ~ 50 hz charge curve : wu technical specifications :- voltage current end voltage 12 v 0 - 15 a 13.8 v 14.4 v 24 v 0 - 10 a 27.6 v 28.8 v size l x w x h (mm) 340 x 260 x 160 weight 11 kgs.